For over 15 years, campsites around Australia have always looked the same… Camping chairs, sleeping bags and Honda’s EU20i Inverter Generator. The World’s Best Selling Leisure Generator. The Honda EU20i was the perfect sized generator for campers who wanted to take advantage of what nature has to offer in the comfort and style they enjoy. The EU20i powered hair dryers, toasters, provided light, made coffees, kept tents cool, charged mobile phones and most importantly, kept quiet! However, with the use of more electrical appliances in day-to-day life, campers demanded more power. So… Honda gave the people what they wanted! 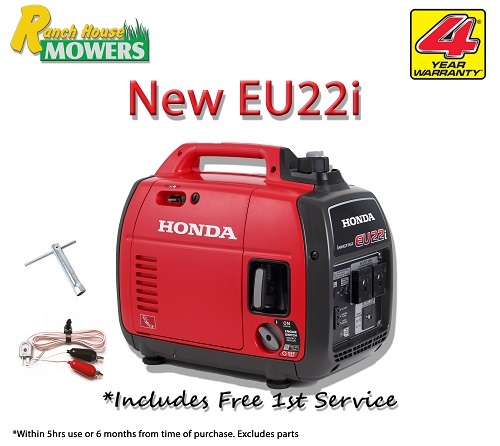 The Honda EU22i delivers better than commercial quality electricity, it has greater fuel efficiency via the built-in Eco-Throttle, increased diameter of oil filler for improved draining & catching of oil and improved recoil starter handle with new metal guard. It has Honda’s advanced 4-Stroke GXR120 engine, which is 20% larger in capacity than the EU20i Generator. The GXR120 has a maximum output of 2200W and up to 8 hours of continuous operation on Eco-Throttle+, 4 litre fuel tank and whisper-quiet operation. The EU22i starts first time every time with Honda's reliable one pull easy start system - your back will thank you! It's environmentally friendly with low emissions, less noise and low fuel consumption than its two-stroke counterparts, and can run up to 8* hours of continuous operation on a full fuel tank. Powerful enough to be used in a wide range of home, recreational and professional uses, the EU22i is backed by Honda's extensive warranties. That's a 4-Year Domestic Warranty, a 12-Month Commercial Warranty, and the support of Honda's 400+ authorised dealerships nation-wide.